Green your Lunch break is back! The sun is up, and we’re back with Green your Lunch break for Spring and Summer 2013! In case you haven’t been or heard of our previous lunch breaks, take a look at this page with pictures of them all! 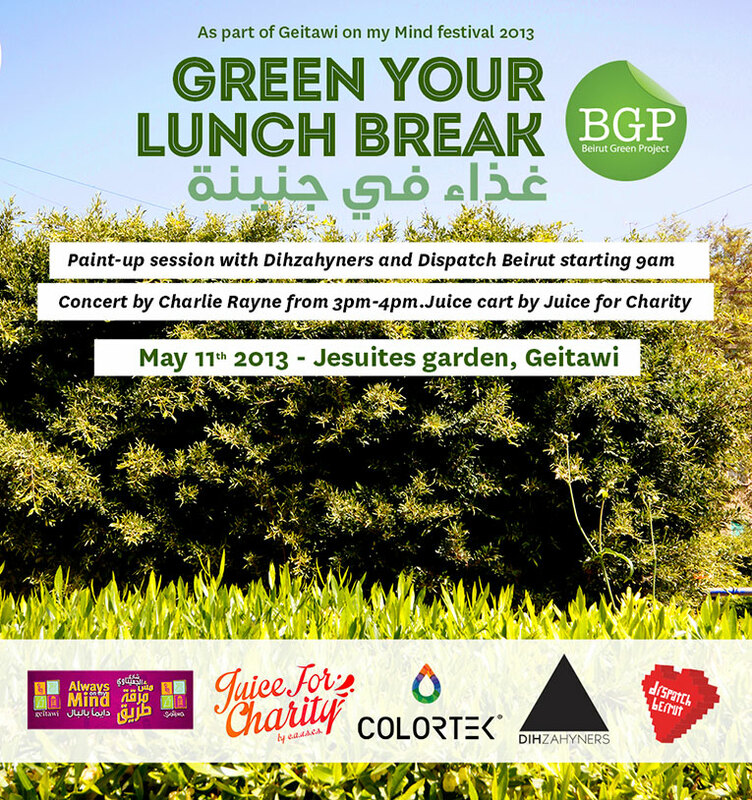 As part of the Geitawi on my mind festival 2013, we are organizing a whole day hangout in the garden. We will start the day at 9am with a paint-up session with Dihzhyners and Dispatch Beirut sponsored by Colortek. At 3pm, we will be joined by the talented Charlie Rayne for a concert. A Juice cart by Juice for Charity will be at the garden all day, raising funds for Food for Blessed! So join us with your garden toys, your books, your laughs, your lunch boxes, and let’s have a great day in the garden! Do you like us ? Beirut Green Project is a dream; it’s a voice being raised to say that we love green spaces, and that we have the right to have these spaces in our city. All pictures on this blog are the property of © Beirut Green Project, unless stated otherwise. Subscribe to follow our news !